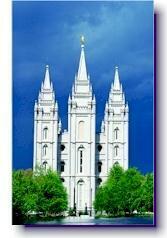 Home » Temples and Ordinances » Are Mormon Temples Christian? The Mormon Church, known officially as the Church of Jesus Christ of Latter-day Saints, operates over 100 temples worldwide. It claims that these impressive looking buildings serve the same purpose as the Jerusalem temple described in the Bible. It also claims that Jesus and His apostles instituted and practiced the secret rituals performed in Mormon temples, including baptism for the dead and eternal marriage.1 Further, the Mormon Church claims that it is the only true Christian church on the face of the earth, because it alone has “restored” these lost temple practices of original Christianity. "A comparison of the activities of the Biblical temple and Mormon temples shows clearly that the two have nothing in common." But are these Mormon claims credible? Are they supported by historical evidence? Most importantly, are they supported by the Bible, God’s Holy Word? This article will show that there is no basis or support in the Bible or early Christian history for the Mormon temples and the rituals performed in them. They are the invention of Mormon founder Joseph Smith, not something taught in the Bible for Christians of the New Testament age. By contrast, Mormon temples exist as places to perform unusual rituals, such as baptism for the dead and eternal marriage. Mormon are also taught secret handshakes there and are given secret names that are said to be necessary to enter heaven. Through these temple rituals men and women can become gods and goddesses, according to the Mormon Church.3 It claims that these rites were a part of early Christianity but were sabotaged by false teachers. It claims that all other churches are false and apostate;4 that Mormonism is the only true form of Christianity in the world. However, these Mormon temple rituals are not supported by the Bible, ancient Jewish literature, or early Christian history. Inside each Mormon temple there is an impressive baptismal font mounted on the backs of twelve life-size, sculpted oxen. This font is modeled after a description in the Bible of a large basin (also called a “laver” or “sea”) that was located just outside the door of Solomon’s temple (2 Chronicles 4:2, 15, see Temple cut-away illustration above). However, the basin at the biblical temple was not used for baptisms, as the Mormon Church teaches (for Christian baptism is a New Testament ordinance). Rather, the Scriptures plainly state that it was used by the priests to wash themselves after offering animal sacrifices in preparation for ministry in the sanctuary (Exodus 30:18-20; 2 Chronicles 4:2-6). The Mormon practice of baptism for the dead is neither a Jewish nor Christian practice, but rather contradicts New Testament teaching regarding baptism and salvation. Likewise, the Mormon temple rite of eternal marriage was never practiced in the biblical temple. Again, there is not one mention of such a temple rite anywhere in the Bible, ancient Jewish literature or early Christian history. To the contrary, in Romans 7:2 the apostle Paul clearly teaches that marriage is only for mortal life: “For the woman which hath an husband is bound by the law to her husband so long as he liveth.” Likewise, Jesus taught us that, “in the resurrection they neither marry, nor are given in marriage, but are as the angels of God in heaven” (Matthew 22:30). The Mormon temple rite of eternal marriage is not a Christian or biblical practice. God appointed only one temple to reflect the fact that there is only one true God (Deuteronomy 12:5,13-14; 16:5,6). By contrast, the Mormon Church operates scores of temples, in violation of this divine mandate. Only priests were allowed to enter the biblical temple. Worshippers – even the king of Israel5 – came no further than the altar of burnt offering in the courtyard. Since non-priests are allowed to enter and participate in Mormon temple activities, this is another point at which Mormon temple practice violates biblical revelation. This prophecy was fulfilled in A.D. 70, when the Roman general Titus demolished the temple; it has never since been rebuilt. Elsewhere, Jesus said that temple worship was about to be replaced by a new form of worship without a temple building: “the hour cometh, when ye shall neither in this mountain, nor yet at Jerusalem, worship the Father … But the hour cometh, and now is, when the true worshippers shall worship the Father in spirit and in truth: for the Father seeketh such to worship him” (John 4:21,23). A dramatic event at the time of Christ’s death on the cross signaled the end of temple worship. The Gospels record that at the very moment Jesus expired, “the veil of the temple was rent in twain from the top to the bottom” (Matthew 27:51; also Mark 15:38; Luke 23:45). Before it’s rending at the time of Jesus death, the thick temple veil (see Figure 1) had served as a barrier to prevent the priests from seeing into the temple’s inner room, the Holy of Holies. This inner sanctum represented the place of God’s holy and glorious presence. Only the high priest was allowed to enter the Holy of Holies, once a year on the Day of Atonement (Yom Kippur). This restriction signified that access into God’s presence was not truly provided by the Old Covenant. In the words of the New Testament book of Hebrews 9:8, “The Holy Ghost this signifying, that the way into the holiest of all was not yet made manifest, while as the first tabernacle was yet standing.” According to ancient Jewish accounts, the thick temple veil was so strong that two teams of oxen pulling in opposite directions could not have torn it.10 Surely, this top-to-bottom tearing of the veil at the moment of Christ’s death was a supernatural act of God, heaven’s response to the completion of Jesus once-for-all atoning sacrifice on the cross. (Notably, no cross is displayed on Mormon temples, unlike Christian churches.) Through faith in Christ, believers are now granted free access into the very presence of God. In the words of the New Testament book of Hebrews, “Seeing then that we have a great high priest, that is passed into the heavens, Jesus the Son of God ... Let us therefore come boldly unto the throne of grace, that we may obtain mercy, and find grace to help in time of need” (Hebrews 4:14-16; see also 6:19;10:19-22). The rending of the veil signified the end of the temple worship system. That system is now obsolete, and we no longer need a human priest or temple. Under the New Covenant established by Jesus Christ, He is the believer’s High Priest in the very sanctuary of Heaven itself. Thus, a “Christian temple” such as the Mormon Church proposes, is a contradiction in terms. 1. The Mormon Church claims that it’s rite of baptism for the dead “restores” an ordinance originally established by Jesus Christ (see Did Jesus Establish Baptism for the Dead? ), while its rite of temple marriage goes all the way back to the time of Adam and Eve: “[S]uch a marriage involves ‘an eternal principle ordained before the foundation of the world and instituted on this earth before death came into it.’” Joseph Fielding Smith, The Way of Perfection. Salt Lake City, 1931, p. 251, as quoted by James T. Duke, “Eternal Marriage,” Encyclopedia of Mormonism, 2:858. Joseph Fielding Smith was the 10th President of the Mormon Church, though he was an Apostle, not President, at the time this book was originally published. 2. All Bible quotations are from the King James Version. 3. A complete transcript of the Mormon temple endowment ceremony is available to read online. On the Mormon teaching that humans can become gods, see Doctrine and Covenants 132:19-20; Gospel Principles, 1997 ed. p. 302; Achieving a Celestial Marriage, p. 130. 4. Mormon scripture includes the first vision account of Mormon founder Joseph Smith. He claimed that God told him all other Christian churches “were wrong; and the Personage who addressed me said that all their creeds were an abomination in his sight” – Pearl of Great Price, Joseph Smith – History, 1:18-19. 5. The exclusion of all but the Aaronic priests from the sanctuary is dramatically illustrated in an incident from the life of the Jewish king, Uzziah. He presumptuously entered the holy place and proceeded to burn incense. The priests confronted the king and ordered him out of the temple: “It appertaineth not unto thee, Uzziah to burn incense unto the LORD, but to the priests the sons of Aaron, that are consecrated to burn incense: go out of the sanctuary; for thou has trespassed; neither shall it be for thine honour from the LORD God” (2 Chronicles 26:18). When Uzziah ignored this rebuke, the text records that God struck him with leprosy, whereupon the priests forcibly removed him from the temple. 6. The awareness and interest of the common people in the priests’ sanctuary ministry is illustrated in Luke 1:10. One of the priests’ daily duties in the holy place was burning incense, symbolic of prayer (Psalm 141:2; Revelation 5:8; 8:4), on the altar of incense which stood immediately before the veil (see Figure 1). The Bible records that as the priest Zacharias performed this duty, “the whole multitude of the people were praying without at the time of the incense” (Luke 1:10). Their prayer was doubtless that Zacharias’ service on their behalf would be found acceptable to the Lord. 7. The Mormon Church refers to these rituals as “sacred, not secret.” However, this is a distinction without a difference, since in fact it instructs its members that, “We do not discuss the temple ordinances outside the temples.” (Boyd K. Packer, The Holy Temple, Corporation of the President of the Church of Jesus Christ of Latter-day Saints, 1982, p. 2). 8. Male Levites from family lines other than that of Aaron performed subordinate temple duties under priestly supervision (Numbers 3:5-9). A recent scientific study published in the prestigious British journal Nature, found a genetic link among contemporary Jewish men claiming priestly lineage; this lends support to their claim of common ancestry tracing back over 3,000 years to the biblical Aaron. The study, headed by Prof. Karl Skorecki of Rambam Medical Centre, Technion-Israel Institute in Haifa, Israel, “found clear differences in the frequency of Y-chromosome haplotypes between Jewish priests and their lay counterparts.” This genetic commonality was found in those claiming priestly ancestry from both the Sephardic and the Ashkanazic communities. The Y chromosome is found only in men and is transmitted through the father. See “Y Chromosomes in Jewish Priests,” in Nature, vol. 385, 2 January 1997, p. 32. 9. This also constitutes a major objection to the Book of Mormon. For the people it describes (pre-Columbian Hebrew immigrants to the Americas, called “Nephites”) are said to have had temples and to have observed “all things according to the law of Moses” (2 Nephi 5:10; 25:24). Yet they are described as descendents of Joseph (1 Nephi 5:16; or Manasseh, one of the “half tribes” associated with Joseph, Alma 10:3), and not the tribe of Levi. For this reason the Book of Mormon people could not have had a valid Aaronic priesthood. Although the name “Aaron” appears 48 times in the Book of Mormon, it is never used with reference to the biblical Aaron or the Aaronic priesthood. 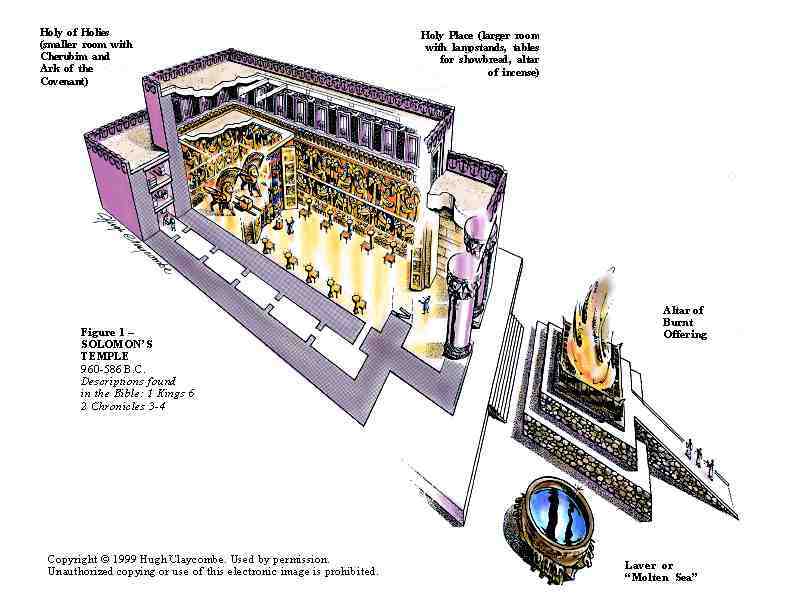 Here is a list of other tabernacle/temple-related terms used in the Old Testament (with number of times used in parenthesis) that are not mentioned even once in the Book of Mormon: “laver” (13), “incense” (121), “ark of the covenant” (48), “sons of Aaron” (97), “mercy seat” (23), “Day of Atonement” (21), “Feast of Tabernacles” (17), “Passover” (59), “house of the Lord” (627). 10. Cited by M. R. DeHaan, The Tabernacle (Grand Rapids: Eerdmans, 1955), p. 115.